GO WHERE THE ACTION IS! 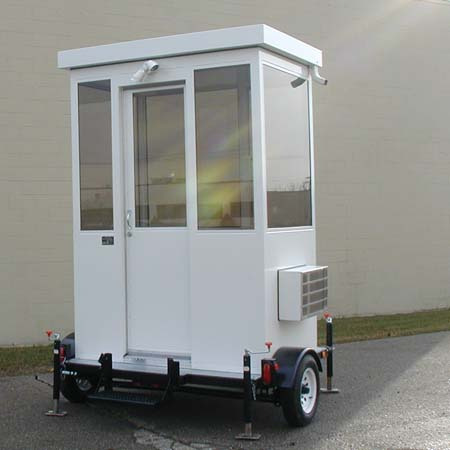 Little Buildings line of trailer mounted guard houses includes this 4'x6' unit. Equipped with optional air conditioning and electric generator, this unit is truly portable! 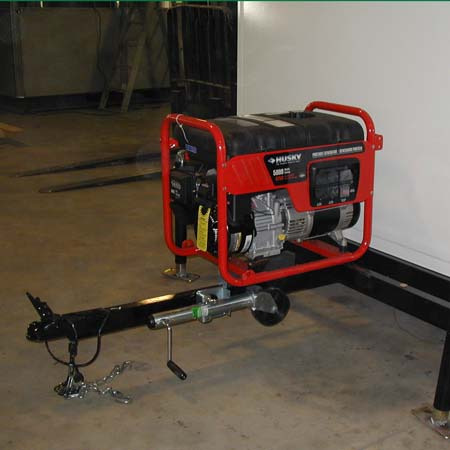 Features include welded steel trailer with tongue and leveling jacks, platform, running lights, and is painted black. Ball coupler and safety chains are included with option for pintle hitch configuration. 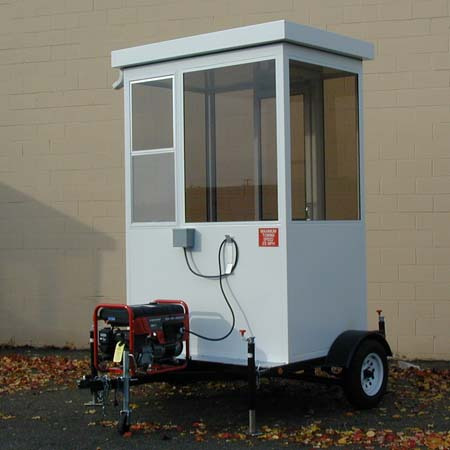 Guard Shack is manufactured from welded galvanized tubing and sheet steel. Sliding door, 3" canopy overhang, sloped roof, and paint in color of choice all standard. 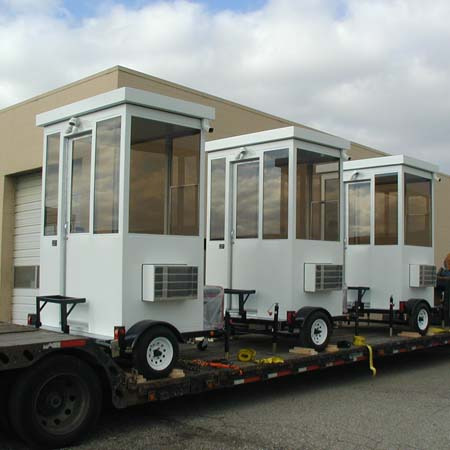 Trailer mounted guard house walls and ceiling are insulated with fiberglass insulation. Built in work counter with storage drawer. This unit has extra high ceiling for tall guards wearing hats. 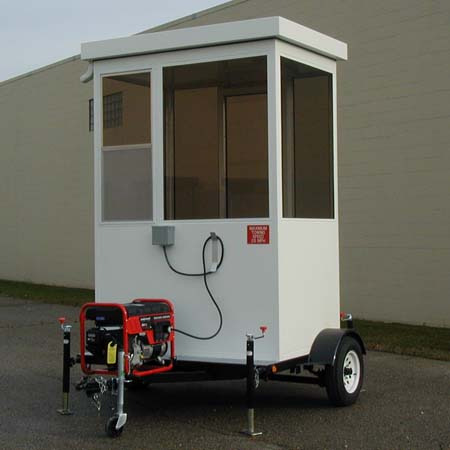 Trailer mounted guard house electric includes heater, light, electrical outlet, and a power cord for hook up to your electric service or to one of our line of optional generators (gas or diesel). Contact our factory for a more complete description of our products. Call 1-888-552-Booth or fill in our short RFQ form below. Many sizes available starting at 4'x6'. 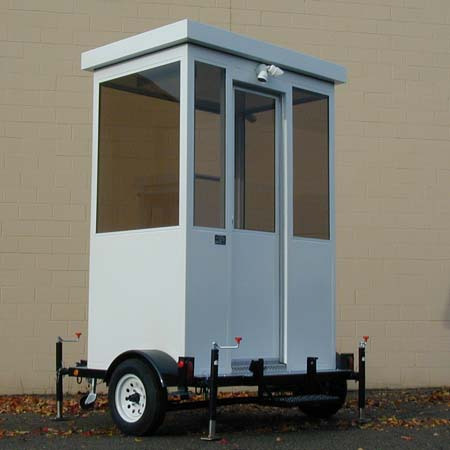 Ask about our trailer mounted Bullet Resisting portable steel buildings for high-security installations. Guardhouses Trailer Mounted ready to ship! © 2019 little buildings, inc. All Rights Reserved.